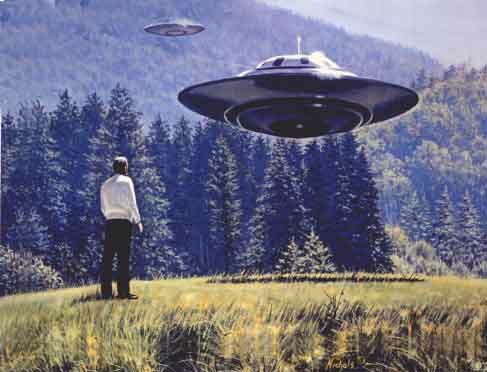 Billy Meier is famous for his alleged contact with the "Pleiadians", and for taking several photographs, one of which was used in the famous "I want to Believe" Poster that hung on Fox Mulder's wall in the X-Files TV show. Billy Meier claims that he was a former Assassin, a hired paid murder and thug, yet these ETs chose him as the most spiritually evolved person on the planet to be Earth's sole ambassador to the stars??? It doesn't make a lot of sense. In fact, it doesn't make any sense and is completely contradictory and illogical. Among the Billy Meier pictures which have been proven obvious fakes (and there are many more than those discussed here!) are the pictures of what Meier claimed to be the Plejarens "Asket" and "Nera". Diligent researchers were able to identify these gorgeous ladies as dancers of the popular American Dean Martin TV-show! Michelle Della Fave contacted Derek Bartholomaus personally, reacting to publications on his website, and confirmed that she was indeed the person on the pictures that are claimed to be of "Asket", and that "Nera" was actually Susan Lund. So there is no basis to doubt that all the pictures of her as "Asket" are fake! These pictures were published in "UFO…Contact From The Pleiades Volume II". The first edition appeared back in 1983, and was fully approved by Billy Meier! In 1991 another picture of the fake "Asket" (shown below) was included in the book "...Und Sie Fliegen Doch!" (German version of "And Yet... They Fly! "), by Guido Moosbrugger. Again, no complaint from Meier was ever noted. Only in 1998 did researcher Kal Korff expose the fact that these pictures showed dancers from the Dean Martin show, in a TV-special and a publication of the magazine "UFO Kurier". Billy Meier and his hoax-collaborators tried to cover up this blunder in ways that are as much hilarious as merely consisting of obvious bold-faced lies. Around 2001, Meier himself started out by claiming his pictures were "forged" by the evil MIB (Men In Black), that the original pictures he released himself were actually replaced by these shadow operatives, in order to discredit Meier! It was a nice try, and many people actually still believe it, as many don't realize that from 1983 to 2001 (for some 18 years!) Billy had no problem whatsoever with these pictures appearing in "Contact From The Pleiades Volume II", and being passed off as showing authentic Pleiadian ETs! It's particularly telling to see how collaborators like Jim Deardorff tried to spin the exposure of fakery as "flawed". By presenting Meier's pictures in a sleight-of-hand type way by comparing them with other unresembling pictures of Michelle DellaFave, or by slightly editing her picture to make it look unresembling, he repeatedly tried to pass off Meier's pictures as being genuine despite the debunking, and even when Meier had already admitted they were "forged"!! Not only did Deardorff try to mislead by comparing 2 different pictures, he also edited the contrast settings of the original used to get the picture on the left, to make it look as if Meier's picture showed a person with a thinner chin than the other picture of Michelle DellaFave on the right. These are all very good examples of how not only Billy Meier, but even his collaborators are deliberately deceiving their gullible audience. And with quite a bit of success! The minute anyone making extraordinary claims, such as Billy Meier, shows evidence of deliberate deception, like the proven admitted fraudulent pictures above it brings the entire rest of their story into question. Billy Meier has demonstrated a propensity for dishonesty, and an inclination towards deception. He is not someone I put faith in, since he has proven himself untrustworthy and fully capable of perpetuating an ongoing large scale hoax such as his case is currently believed to be. This is part of the reason we cannot get mainstream scientists and academics to take a serious look at this subject!